A person living, or dying, with cancer needs to know that he won't be shunned and left out of your affections. Disease and dying are hard subjects for us to understand because this is emotionally uncharted territory for most people. 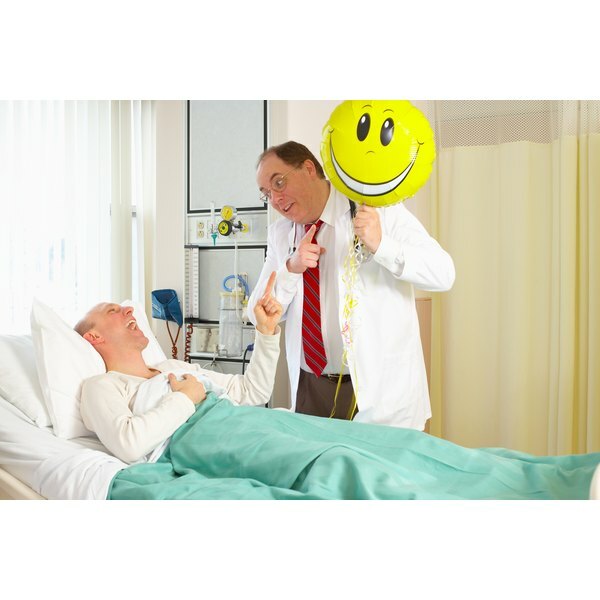 The ability to cope with your uncertain feelings with a sense of humor, compassion and grace will help the cancer sufferer manage his own reactions and emotions to his medical condition. Be aware of the seriousness of the cancer patient's illness. Know if the patient is expected to make a remission in the cancer or if the patient has a terminal illness. Focus your care and consideration in the regard to the patient's prognosis. It does not help a terminal patient to give the person false hope with sentiments to "get better" when the cancer is advanced and incurable. Bring comforting gifts to a cancer patient, regardless of the disease's prognosis. The dying deserve care as much as those who will live. Buy or make warm blankets or quilts for the patient to cover themselves if they're in a hospital or hospice settings. Choose a bed jacket or night robe if the facility doesn't allow you to bring quilts. Bring slippers or socks for feet to help with temperature regulation. Cancer patients, according to the University of Texas Health Center, can develop shaking chills from some chemotherapy medicine. Buy hats to cover the heads of those who have lost hair through chemotherapy and radiation therapy. Observe the patient's faith with them. Take her, if medically possible, to religious services. If she isn't religious, spend time with the patient in reading inspirational poetry and essays. Make sure the documents and activities are compatible with the person's beliefs and that the patient wants to have these activities. Give the patient her favorite books to keep her comforted when she has time alone. Spend time with cancer patients regardless of their prognosis. Time is the most precious thing that a cancer patient has after his diagnosis. Bring family members to visit the cancer patient if the person's strength allows and according to the care facility regulations. Don't dwell on the diagnosis but take the time to enjoy his company by talking about ordinary things, such as how the family is doing at the present time. Be careful about talking about the future with those who have terminal cancer because these patients won't have part in these events and plans. Talk about the future to reassure terminal patients that family members and friends will be cared for when the patient passes on. If the patient feels comfortable sharing memories, spend time looking at photographs of family and friends. Compile a scrapbook of the patient's life if the person wishes to review his life, relationships and accomplishments.